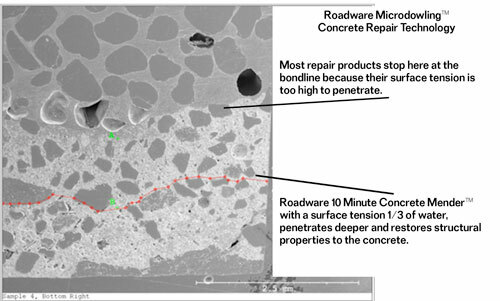 Roadware Concrete Mender™ is available in safety yellow. 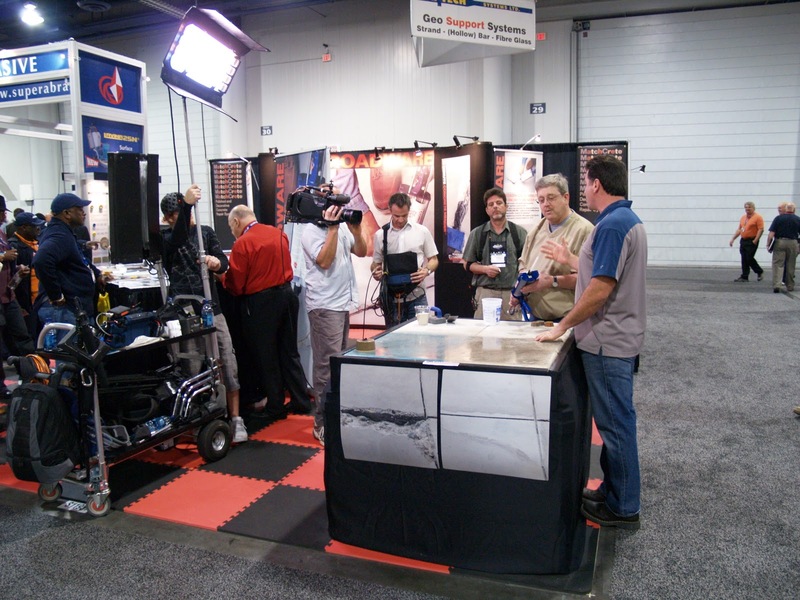 Use for creating permanent yellow safety lines in concrete floors. Yellow Concrete Mender™ cures to a bright safety yellow color in minutes. 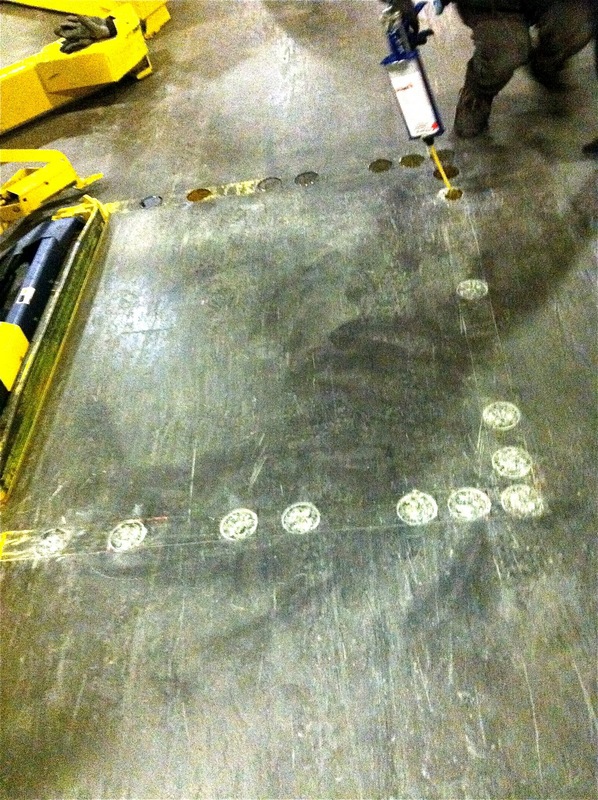 Yellow safety marking can be permanently installed in concrete floors with this material. 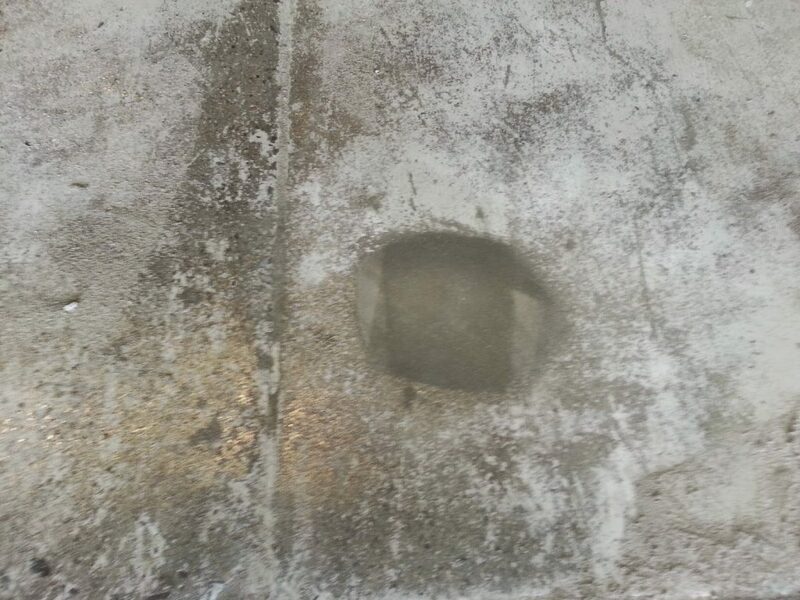 The photo above shows Concrete Mender™ Safety Marking after a year of commercial service. Bill Smith, US Food Service, Wixom, Michigan. After years of frustration trying to keep safety line marking in place in a cold storage warehouse, Bill Smith of US Food Service in Michigan started looking for a better way. 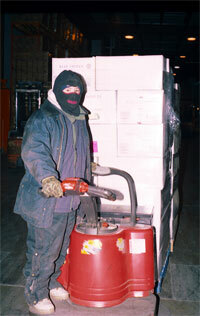 Installing safety line marking in a 38°F cold storage warehouse is especially challenging. With the 24/7 operations and the heavy fork lift traffic, there was never enough time to let traditional marking paint to cure without the forklift tires marking up the paint. At cool temperatures, the cure times were even slower. Marking tape fared no better. The cold concrete was hard to adhere to and the heavy traffic would quickly damage the marking tapes. 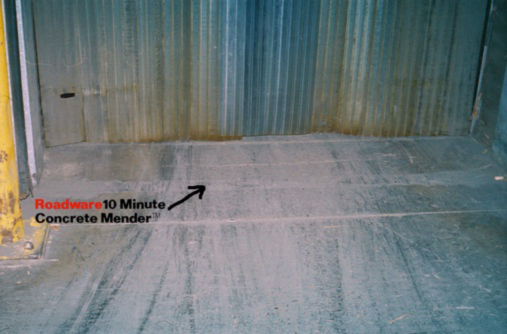 Bill was using Roadware 10 Minute Concrete Mender™ to repair cracks, joints, and spalls in the warehouse floor. 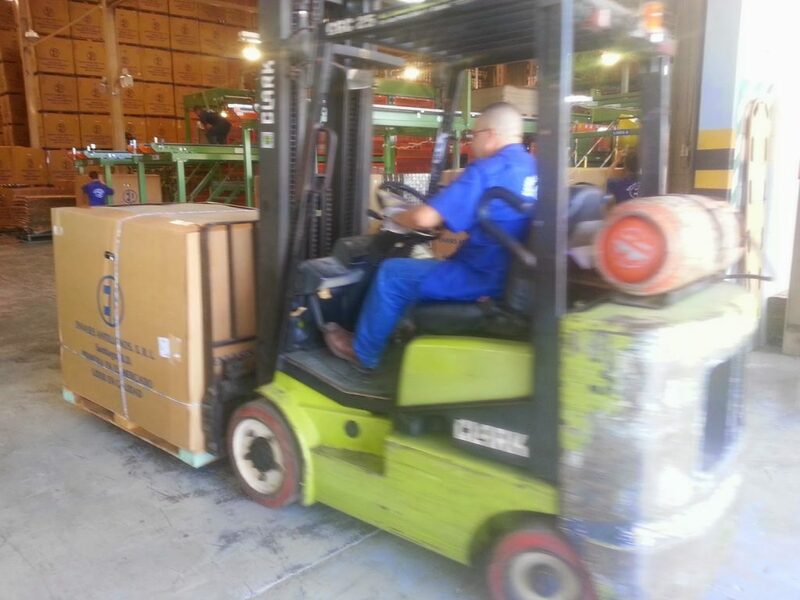 He liked the fast cure times at low temperatures and he noted the repairs hold up very well to forklift traffic. Bill thought, “What if we could fix our safety line issue with Concrete Mender?” After experimenting with different types of Yellow sand and a request into Roadware for MatchCrete™ Concrete Mender factory colored in Safety Yellow, the line marking MatchCrete™ system was born. After much experimentation, here is the system that works the best. 1. Scarify a shallow recess in to the concrete the length of the line marking. This can be done any number of ways. Stacking several diamond blades together and placing a temporary saw guide works best. 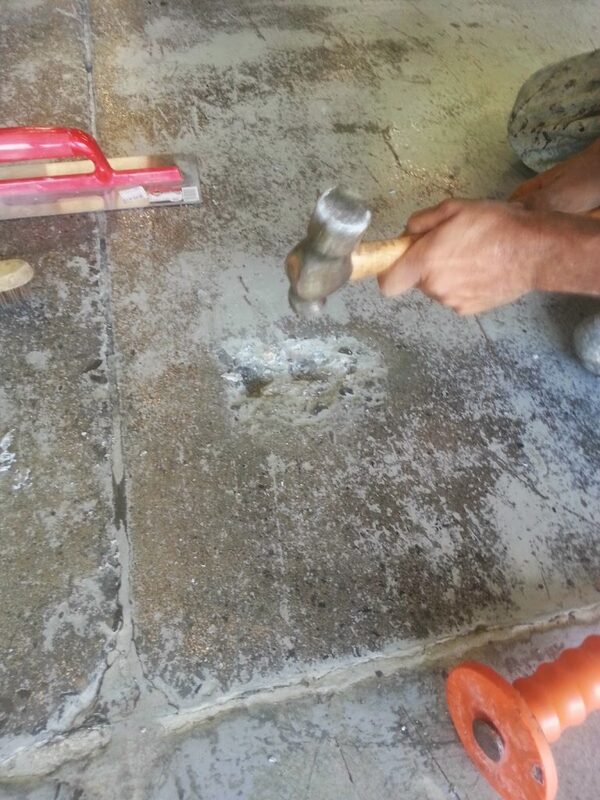 Cut the recess about 1/4 inch deep and 1 inch wide. 2. Vacuum all dust and debris from the saw cut area. Mask off the recess with duct tape. 3. Carefully flood the recess area with Safety Yellow MatchCrete™ Concrete Mender. A small amount of safety yellow quartz sand may be used to choke-off any material that flows too far into any cracks or joints. The top of the material should be slightly recessed and smooth. 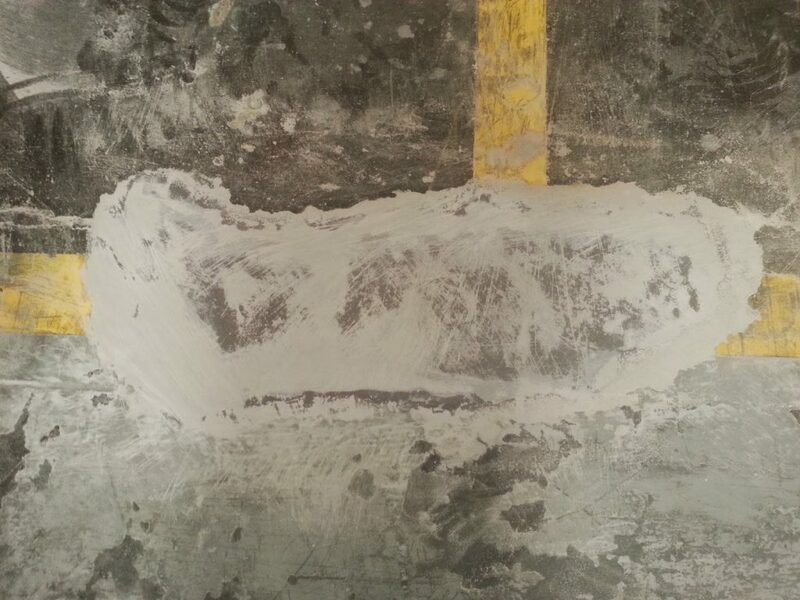 Permanent yellow line marking in concrete floors beyond paint. The lines will be ready for full traffic in about 15 minutes at room temperature. Give them a few hours to cure if working in a cold room or freezer. No special maintenance is required.